Inspired by Savannah: Available Today on DVD -- Peppa Pig - Sunny Vacation -- Get Your Copy Now! 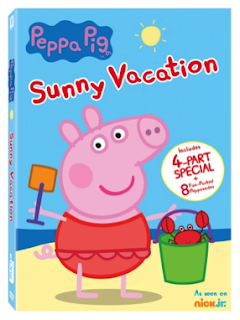 Available Today on DVD -- Peppa Pig - Sunny Vacation -- Get Your Copy Now! "Get ready for adventure when “Peppa Pig Sunny Vacation” arrives on DVD , today, August 2nd , from Twentieth Century Fox Home Entertainment and Entertainment One. It’s time for a special Family Holiday! Celebrate the summer as we come along with Peppa, George, Mummy Pig and Daddy Pig on a Sunny Vacation abroad. Peppa is enjoying all of the sights and sounds of Italy, but she also can’t wait to go home and see her friends! “Peppa Pig’s Sunny Vacation” on DVD is packed with excitement as Peppa and her family set off on their trip across Italy. Kids and parents alike will love the four-part sunny special with 8 additional super fun-filled Peppasodes! I haven't heard of this show before, but my little cousins love anything with animals in it. I'm sure they'd love this.